Here in Colorado, at the foothills of the Rocky Mountains, our growing season is pitifully short. We brace for storms as early as October and as late as May, and many an untimely freeze has devastated the average gardener. But as the tomatoes have long since withered, the peppers have perished and zucchini is a fond but distant memory of the past, my kale lives on. Most local farms still offer kale, and you’ll find several varieties in the markets and grocery stores. Tuscan kale—also called Lacinato, dinosaur kale or Cavalo Nero—has a nubby, rugged texture that holds up especially well in stews and roasting. Curly varieties are tender enough for quick sautéing and raw salads, and Red Russian kale, sturdy as a weed, has green-purple leaves that add color and antioxidants. All varieties of kale are types of crucifers (like cabbage, broccoli and Brussels sprouts), and are rich in compounds that help prevent cancer, curb inflammation, and may reduce cholesterol. These recipes use three different varieties of kale, but you can generally substitute one for another. And while black truffle salt doesn’t grow on any farm I know of, it’s still a lovely addition to this early winter meal. Red Russian kale is outstanding in the hearty stew, but Tuscan kale is a beautiful stand-in as well. This simple classic soup is one of our winter staples; we used heirloom carrots in three different colors, which yielded beautiful results. Peeled and cubed pumpkin or winter squash are other delicious seasonal additions. You can also add pasta shells or orzo toward the end of cooking time, or stir in pieces of day-old bread for a ribolitta-style soup. 1. Heat olive oil in a medium soup pot. Saute onion for 2–3 minutes, until just softened; add garlic and cook for 1 minute longer, stirring. Add broth, beans, rosemary sprig and cheese, if using. Bring to a boil, then reduce heat to medium-low. Simmer, partly covered, for 45 minutes to 1 hour, until beans are tender but not mushy. 2. While the soup simmers, cut stems and center ribs from kale, and cut leaves into small pieces. If carrots are very slender, cut them crosswise into 1/2-inch-thick rounds. If carrots are thicker, cut into a medium (1/2-inch) dice. 3. 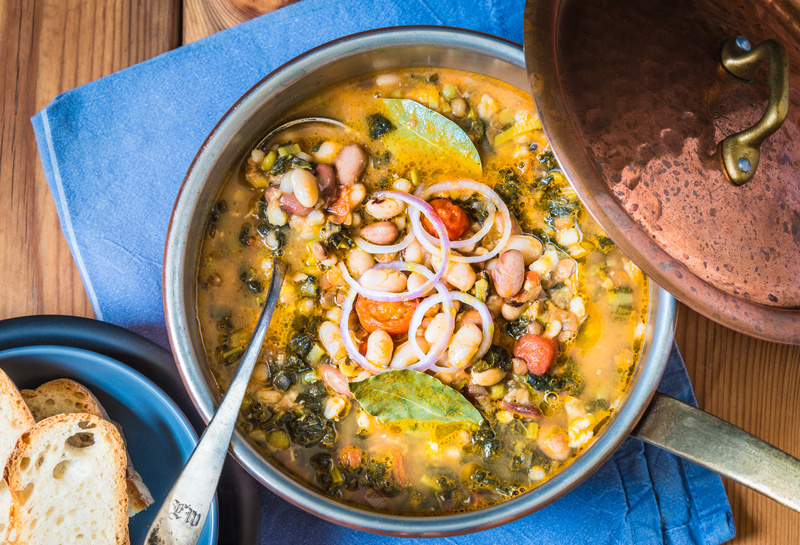 When beans are nearly tender, stir in kale, carrots and red pepper flakes. Cook for 10 minutes more, until carrots and kale are tender. Fish out the rosemary and cheese rind, and season the soup to taste with salt and coarse black pepper. To serve, ladle into bowls, drizzle with additional olive oil, and shower with chopped parsley. Serve hot. Massaging the kale with oil, salt and acid before serving soften the aggressive flavor and texture. This is especially good with fig balsamic vinegar. You can also use tamari-roasted almonds in place of the honey-spiced nuts, and add a handful of currants or chopped dried figs. 1. Lay a sheet of parchment paper on a flat surface. Combine honey, cayenne pepper, cumin, black pepper and cinnamon in a small pot; cook over low heat until honey is thickened and dark golden. Stir in walnuts until completely coated. Transfer to parchment, spreading in a single layer, and breaking up to separate nuts. Let cool completely. 2. Remove stems and center ribs from kale, and discard. Cut leaves crosswise into thin strips; place in a medium bowl. Drizzle kale with olive oil and vinegar; lightly sprinkle with salt. Massage with your hands to coat leaves and let stand for 5 minutes. 3. Core and dice apple and pear, and add to bowl with kale, along with shallot. Add candied nuts, and toss to mix. To serve, divide salad between four individual plates, sprinkle with cheese if desired, and serve immediately. Roasted kale leaves are a fast, appealing way to cook kale; Tuscan kale is especially nice, since the leaves are flat and cook more evenly. Vary the spices—chipotle powder, garlic or cumin are nice additions—and serve them upright in a squat, heavy glass for a novel presentation. 2. Separate leaves of kale and trim the bottom inch off stems. Drizzle with olive oil and sprinkle with garlic; rub oil into leaves with your hands. Arrange in a single layer on a large baking sheet. Roast for 5 to 7 minutes, until leaves are crispy, being careful not to burn them. Remove from oven and immediately sprinkle with salt and pepper. 3. Arrange kale leaves in two squat, heavy glasses, such as a rocks cocktail glass, or arrange on a large serving platter. Serve immediately.